Welcome to Legitimate Theater: a column dedicated to movie-based stage musicals. The goal of this series is to explore those stories that originated in films and eventually worked their way onto Broadway and beyond. By the end of each entry, there will hopefully be a better understanding of this odd but rampant trend in modern entertainment. Are these stories really worth telling through song and dance? How can it even compare to the technical prowess of a camera and seamless editing? Join me on this quest as I explore the highs and lows of this trend on the third Wednesday of every month and hopefully answer what makes this Legitimate Theater. Welcome to the first Bonus of Legitimate Theater. These won't run nearly as often as the monthly columns, but it only felt right to explore a handful of musicals within the next few weeks. There are currently three adaptations up for Best Musical at the Tonys this year (one being of a TV series), and it would be wrong of me not to cover them before the ceremony starts. I have decided to start with what is arguably the most familiar of the three going in: Frozen. It's a film that's grossed billions, made Robert Lopez an EGOT winner, and created a new standard for Disney. So, what exactly can a musical with music already written bring to the stage? Well, that's what I'll explore as I approach the expanded upon story of Anna and Elsa and their wonderful frozen kingdom. 1. "Vuelie/Let the Sun Shine On"
2. "A Little Bit of You"
3. "Do You Want to Build a Snowman?" 4. "For the First Time in Forever"
5. "Hans of the Southern Isles"
8. "Love Is an Open Door"
9. "Reindeer Are Better Than People"
10. "What Do You Know About Love?" 12. "Hans of the Southern Isles (Reprise)"
15. "For the First Time in Forever (Reprise)"
20. "Color by the Minute"
22. "When Everything Falls Apart"
"Vuelie/Let the Sun Shine On"
Much like the film, it opens with an almost choir-like call. It's grand and operatic, capturing the awe of what this musical can be out in the frozen tundra. It builds such an awe that its shift into the "Let the Sun Shine On" part feels like a perfect start to an epic. It's essentially an expansion on "Do You Want to Build a Snowman?" but provides a backstory that is a lot of fun and gives depth to Anna and Elsa as characters. There's so much lyrical and rhythmic fun to be had here that it ends up setting up the movie as something both big and emotional as well as small and intimate. It may not be the most iconic opening number, but it captures the scope perfectly of what's to come. "Do You Want to Build a Snowman?," "For the First Time in Forever,"
"Love is an Open Door," "Reindeer Are Better Than People," "In Summer,"
"Let It Go," "For the First Time in Forever (Reprise)," & "Fixer Upper"
It was to be expected that a movie musical that grossed over a billion dollars would have some overlap in the song department. There's so many hits here that audiences likely already know going in. What's more incredible however is that because they always had a Broadway feel to them, they are perfectly complimented to the bigger and grander production where singers belt out more broad emotions. In some cases the songs are expanded upon lyrically to give depth of character and create a better sense of who these characters are. I'd even argue that putting it on Broadway is the smartest thing that could be done, as it finally achieves the potential that "Let It Go" has always had to be a big and empowering number. It's still the same tunes essentially, but by making it bigger and more harmonic, it feels more essential than in the sometimes tinny movie production of the songs. Among the show's highlights is the fact that Elsa has more to do in the music department. She doesn't just have "Let It Go." She has a handful of songs both early and late in the show that convey her inner struggle in ways that actually elevate the power of "Let It Go" (and her character in general). Here comes a late entry for a song that's likely to transcend the actual show and become a hit for the show. "Monster" conveys an inner struggle of "conceal, don't feel" in song form with a big operatic harmony, vocals that are struggling for control, and an emotional sense that adds power. You understand Elsa's entire struggle in this one song, though earlier song "Dangerous to Dream" also does it on a smaller and more intimate scale. With that all said, the show really gets the idea that Elsa needed more songs, and they largely didn't disappoint. I have been told via YouTube comments that this is a song that's better in context. That's a fair enough assessment, given that some Broadway numbers throughout history compliment dance better than lyrics. With all of that said, it isn't the greatest when put on the record for a variety of reasons, notably that you'd give secondary character Oaken the longest song in the show. Also, it's so upbeat and repetitive that it can't help but be a tad bit annoying. Sure, the concept of "Hygge" is fun, and in some sense is Frozen's version of "Hakuna Matata." But it's still a bit redundant as an actual track on an album and loses some points, especially given that it doesn't hold as much weight or emphasis as the other songs. What Does It Bring to the Story? What's incredible about this particular soundtrack is that even the songs that carryover are given a new and improved context. Everything has a more Broadway sound, with the performers adding more personality and tics to the lyrics. Some of those songs also have lyrical changes to improve an understanding of story through song. With that said, another significant change that works is rearranging the songs in a way that perfectly builds. In the movie, "Let It Go" felt like another song. Here, it's what the first act is building towards, and it makes better sense. 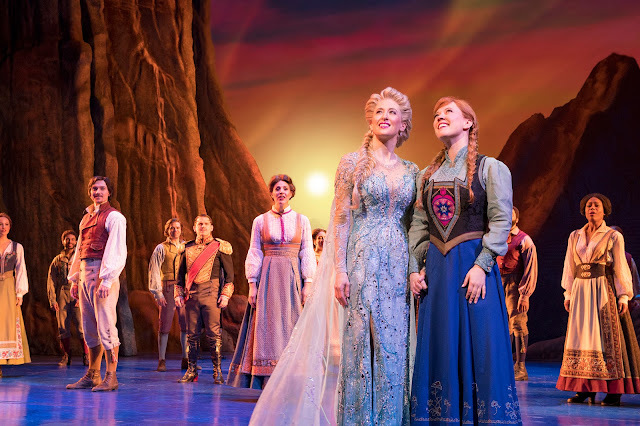 What's also great is that most of the new songs add depth and emotion to the central relationship while also expanding upon the supporting characters of Hans and Kristoff in songs that give them something more beyond blank male roles. As mentioned earlier, the expanded upon Elsa songs in particular add a deeper resonance to the show's themes, and even Anna's late entry "True Love" has a power in its intimacy. It is a gamble when adapting a movie musical to stage, but here it manages to work almost too perfectly. Disney movies are generally written to be operatic, or Broadway shows with a lot of power over the senses. I don't know that Frozen is their finest hour, but it still achieves a sense of purpose in ways that could've just been cynical. For starters, the additional songs hold their own alongside the tinkered carryovers. It also does it without feeling out of place. As a full picture, it's a great update to the musical and finally achieves certain promises that the film failed to achieve by making the big numbers feel big, and by making the sister relationship at the center feel like something more special. This is an example of expanding story for true benefit, as it shows areas where the movie could've used improvement and in some ways couldn't because it's better suited to Broadway. I don't know if I can yet say the same for Mean Girls or SpongeBob Squarepants, but at least Frozen has avoided just being a lazy and cynical cash grab. That's hygge. Coming Soon: With movie-adapted stage musicals up for Tonys this year, expect columns on Best Musical nominees Mean Girls and SpongeBob Squarepants in the next few weeks.